Highly desirable Model with original pipe top still intact. The center triangular gable-like crown that normally sits on top is sitting just behind the tilted music rack as its glue joint was loose. It is missing one of the top finials. We can have a new copy made for the center crown if you like. The video shows the crown in place. 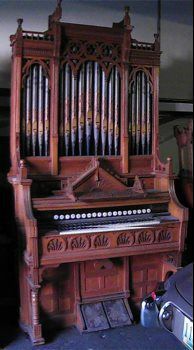 History tells us that this organ was made in 1890. Before that, this model would have had cast metal stop knobs, and after 1890 the case design changed.